My favorite foundation of 2016 was definitely Nars Sheer Glow. I repurchased about 3 times and used it pretty much every single day when I bought it as well. It's just absolutely incredible. I wear the shade Barcelona. I just love everything about this foundation. The packaging is just so super sleek and cute, The product itself is just amazing. 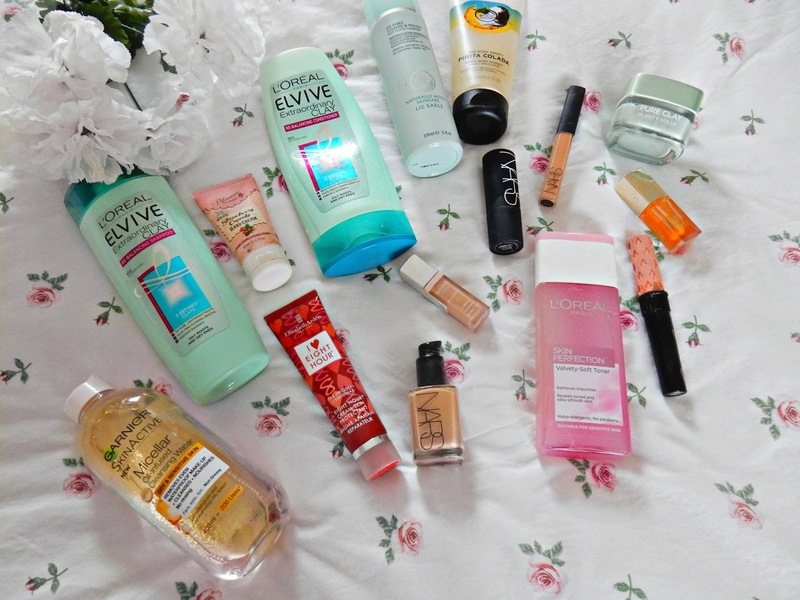 It has such incredible coverage and makes my skin look so radiant and hydrated. I'm not normally one for full coverage foundation but I find this makes my skin look just like skin which is amazing. I love it. When it comes to concealers I had two favorites of 2016, one high end and one high street option. 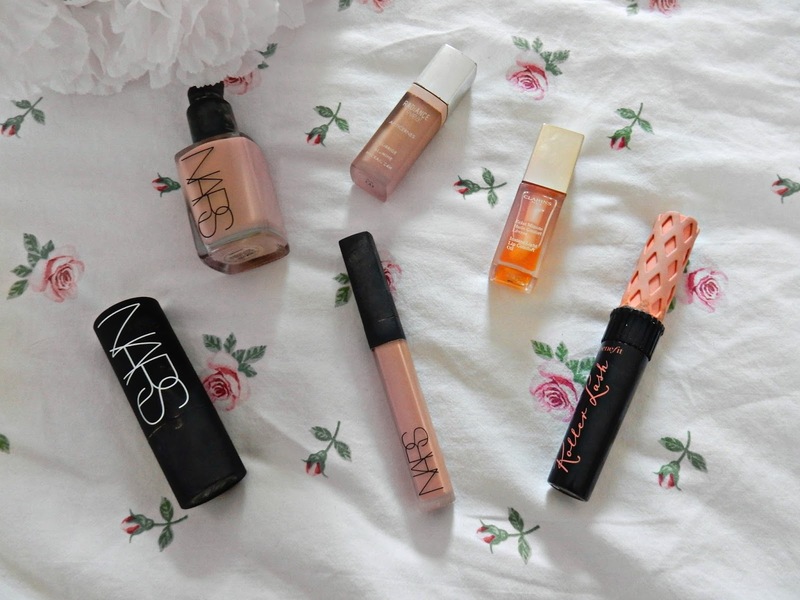 The high end is again, from Nars and was the Nars Creamy Concealer in the shade Biscuit. This concealer is literally incredible. It's peach toned which means it compliments my skin tone incredibly well, color corrects, and gets rid of all those horrible dark circles under my eyes. A serious problem when you're an insomniac like me. I've noticed how bright and radiant my eyes look when I wear this and it's definitely something I'm going to repurchase when pay day comes around this month. My other favorite concealer is from Bourjois and is the radiance reveal concealer that illuminates and hydrates. I absolutely love this concealer. It was one of my first purchases of 2016 and I kept on repurchasing is at not only does it do everything I want to do in terms of brightening up the under eye area and making it look super radiant but it's also super cheap and cheerful as well. This is one of those products that I noticed had a lot of mixed reviews but I personally love it and think it works really well for what I want it to do. The coverage is also pretty amazing too. My all time favorite lip product of 2016 was the Clarins Lip Oil in Honey. I had heard and read so much about this from other youtubers and bloggers and I remember when I was coming back from Mauritius I spotted it in Duty Free and bought it without a second thought as I really wanted to try it and I must say it has not disappointed. It's absolutely amazing. It leaves my lips feeling so super hydrated and nourished which is amazing. I find this perfect for leaving on my lips overnight as it really preps my lips for any lip products I'll wear the next day. I also love how nice and big the applicator is as you get a lot of product from it. I'd highly recommend this. Click HERE to read a full review of this product. Another make up favorite has been a Nars Blush in the shade South Beach. It's an absolutely gorgeous rose gold peach shade that is just so incredibly beautiful. I find that it really compliments my skin tone and is really pigmented too. A little definitely goes a long way with this blush. I also love the packaging. More things need to come in the form of a stick I think. In terms of skin care favorites one of them definitely has to be the Elizabeth Arden 8 Hour Cream. I finally picked this up in late October and absolutely fell in love with it. It's such a fantastic multi use product. You can use it as a moisturizer, face mask, cuticle oil, lip oil, it's just absolutely amazing and life changing and one I recommend everyone to have. I can't say I've ever tested the 8 hour theory but either way it's amazing. Two cleansers I kept repurchasing and using in 2016 was the Liz Earle cleanse and polish which I have used for years and the Garnier Oil Infused Miceller Cleansing Water. Both of these cleansers are absolutely amazing. The Liz Earle cleanser has been a firm staple in my skincare routine since I was about 18. It's a cream cleanser that really cleanses the skin and leaves it feeling super soft. The Garnier Oil Infused Miceller Water is also amazing at removing make up especially tough eye make up, perfect to use after a night out as it really removes the make up as well as leaving the skin feeling fresh and clear. One of my favorite toners has been the L'oreal Skin Perfection Velvety Soft Toner and it's literally what it says on the skin. It leaves your skin feeling so super soft and leaves the skin feeling pretty much perfect. I absolutely love using this. Even on days where I wear no make up I like giving this a run over my skin as not only does your skin feel super refreshing but it also leaves it in amazing condition for applying make up the next morning. I love it. My favorite face masks of 2016 was the L'Oreal Pure Clay Masks. Three masks were released by L'oreal and my favorite of the three was definitely the pure clay glow mask. I didn't have this mask on hand so I only put the glow mask in the photo oops. I have really dry skin and I just find the glow mask does everything I want it to do and more. It just find that it really clears and brightens the skin as well as hydrates it as well. I've done a full post on all three masks for you to check out HERE. My last simple skincare favorite of 2016 was this strawberry cupcake handcream from Patissere De Bain. If you're looking for a simple handcream that not only leaves your hands smelling absolutely delicious but also leaves it feeling incredibly soft and supple. 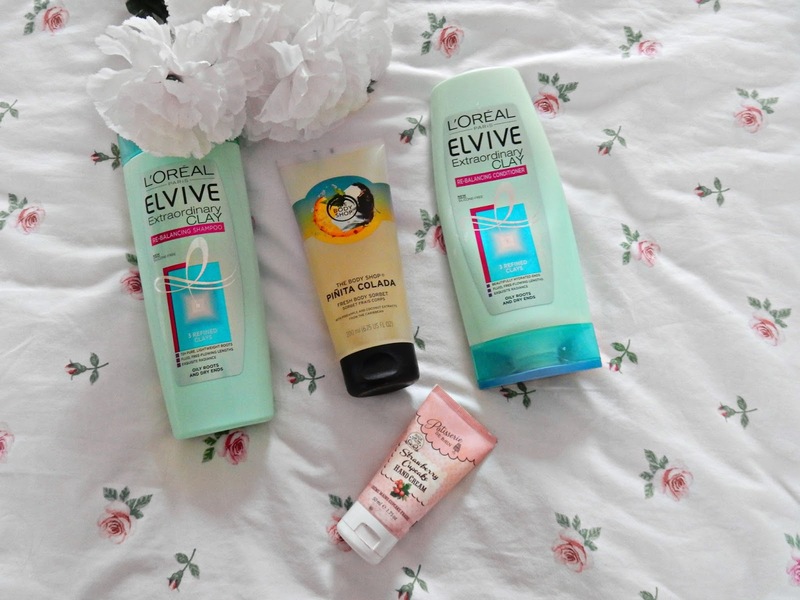 I'd recommend any of their products as they are all amazing. My favorite hair care products of 2016 was definitely the L'Oreal Extraordinary Clay Shampoo and Conditioner. I always struggle to find a decent shampoo for my hair because it gets so greasy easily and I also have a really dry scalp but this combats both problems. I absolutely love this and the entire range. I've noticed such a difference in my scalp and my hair in general. 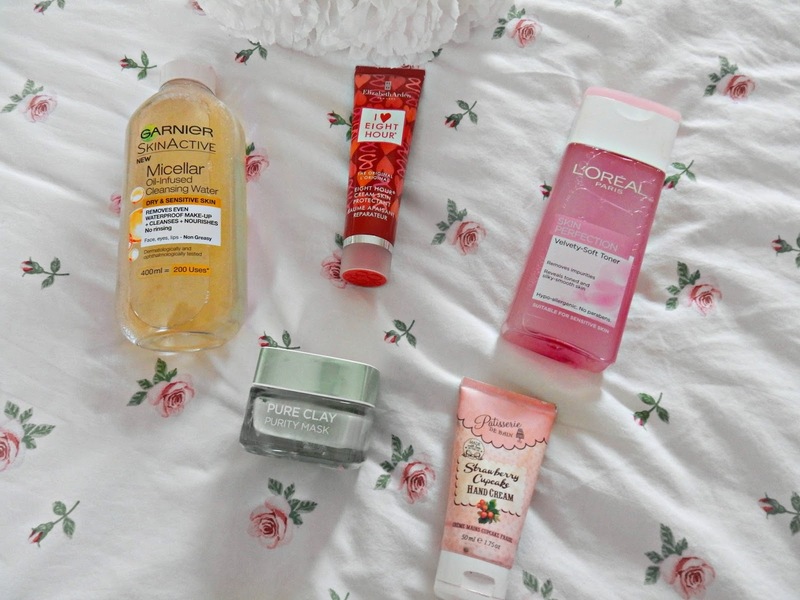 Definitely products I kept on repurchasing in 2017. My final beauty favorite was a range the Body Shop bought out in the summer and that was the Pinita collection. It smells absolutely incredible. If you know me or follow me on social media you'll know that I am a huge fan of sweet scents and this range wasn't one I wanted to miss. My favorite product from this range was the body sorbet which I actually bought about 6 off as I still love using sweet scents like this all year round. This is basically a shower gel and in the summer time I put it in the fridge as it was just so much more cooling. I hope they bring it back this summer. So there we have it, all my 2016 beauty favorites. 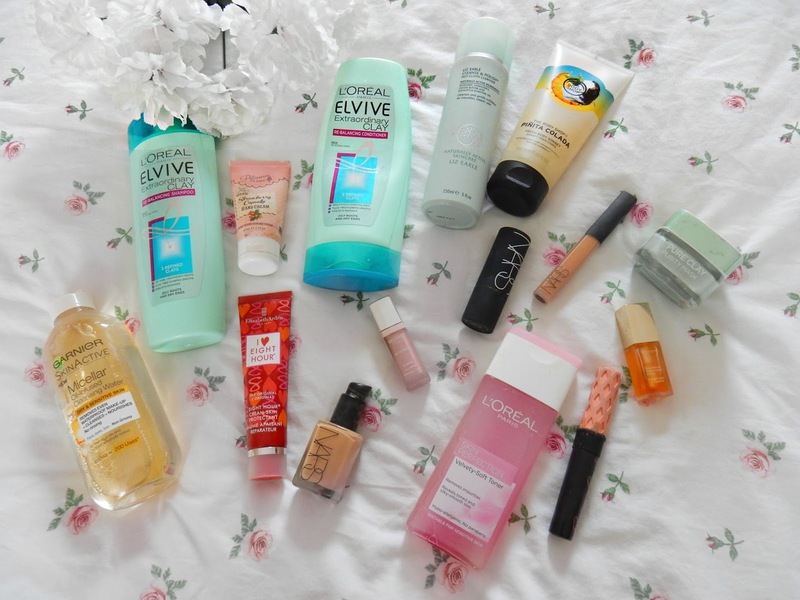 I really enjoyed writing this as it was fun getting all the products together and seeing which ones I have been using and loving the most over the course of 2016. 2017 will definitely be the year I experiment more with new products and brands. Let me know if any of these products here are also made into your 2016 favorites.